ISLAMABAD, Jan 29 (APP):Federal Minister for Information Technology and Telecommunication Dr Khalid Maqbool Siddiqui on Tuesday said that the telecom sector contributed a lot in unlimited connectivity by bringing fast mobile internet to the country. 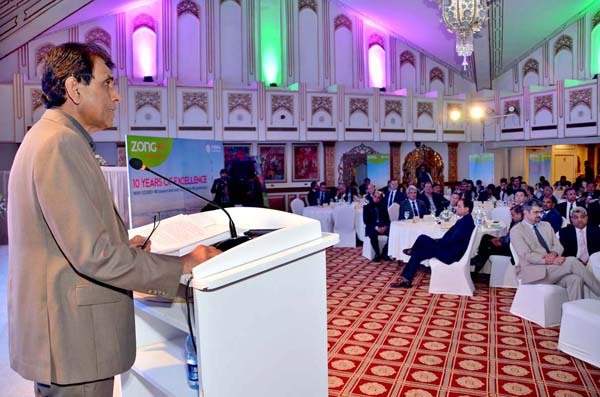 The minister said while addressing the ceremony of Zong (China Mobile Pakistan) celebrating ten years in Pakistan. He said that over the last decade, the IT and telecommunication sector in Pakistan evolved impressively. He said with the advent of mobile internet, Pakistan is on the same route of development as that of neighboring countries. “Telecom companies are now at the forefront of pushing Pakistan into the digital century” he added. The minister said that China Mobile Pakistan has been an integral player to create a 4G ecosystem in Pakistan. He said being the first operator to invest in 4G in Pakistan, the company has continued to uplift the telecommunication infrastructure across the country. With more than 10,000 4G cellular towers and 4G customers exceeding more 10 million, ZONG 4G brand is deeply rooted in the hearts of the people, he said. It can be said that undoubtedly CMPak has grown over the period of ten years, and witnessed the evolution and leaping advancement of the telecom industry from the 2G voice era to the 4G digital era in Pakistan, he said. Khalid Maqbool said we surely believe that CMPak will continue the endeavors and be at forefront to uplift the ecosystem in Pakistan. As the leading operator of digital services, it is incumbent on CMPak to continue to increase the investments, promote the infrastructure up-gradation of Pakistan’s telecommunications industry, contribute to enhance the development of mobile Internet, and transform lifestyle of our people. Federal Minister said that advancement of Information and Communication Technology (ICT) led development remains a priority for the government. In pursuance of our mission digital Pakistan, the measures for trials for 5G and the pursuit for digitalization across the country are already being undertaken, he added. And through our policies we will continue to support the development of an investor-friendly business environment and promote advancement of the ICT industry, he said. On the occasion ambassador of China Yao Jing said that the government of Pakistan had supported China Mobile in Pakistan adding that cooperation like this would further enhance the bilateral relations between two countries.